IMTS 2018 -- The International Manufacturing Technology Show captured the No. 2 spot on the 2018 Trade Show News Network's (TSNN) Top Trade Shows list. For more than 20 years, the list has ranked the top 250 shows by net square footage. "It's quite a feat to land on one of the top spots of the 2018 TSNN Top Trade Shows list," says Rachel Wimberly, President of Tarsus Media, Trade Show News Network. "IMTS clearly is a show that has been robust and growing for many years." IMTS 2018 ran from Sept. 10 -- 15 at Chicago's McCormick Place. With 1,424,232 net sq. 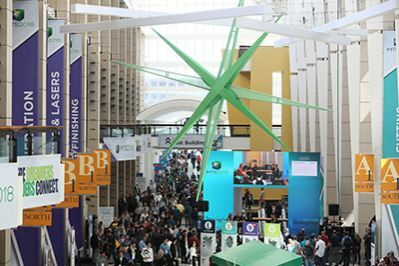 ft. of show floor and 129,415 registrants, IMTS 2018 was the largest show ever. "The record size and attendance at IMTS 2018 reflect the renewal of manufacturing," said Peter R. Eelman, Vice President and CXO at AMT -- The Association for Manufacturing Technology. He added, "IMTS 2018 highlighted the explosion of digital technology and highly advanced manufacturing techniques. New ideas and methods dominated the show floor. Combined with a strong economy and industry growth this allowed IMTS to break all of its own previous records." CES was ranked the #1 show.